I'm a mom, so my wardrobe has changed from fashionable, to mom-able. Sometimes that lends itself to the styles going on now, and other times it lends itself to the fun and move-able. Combining the two is a fun way to be a mom and somehow get a college kid to ask where you got your shirt from because it's "Awesome"! 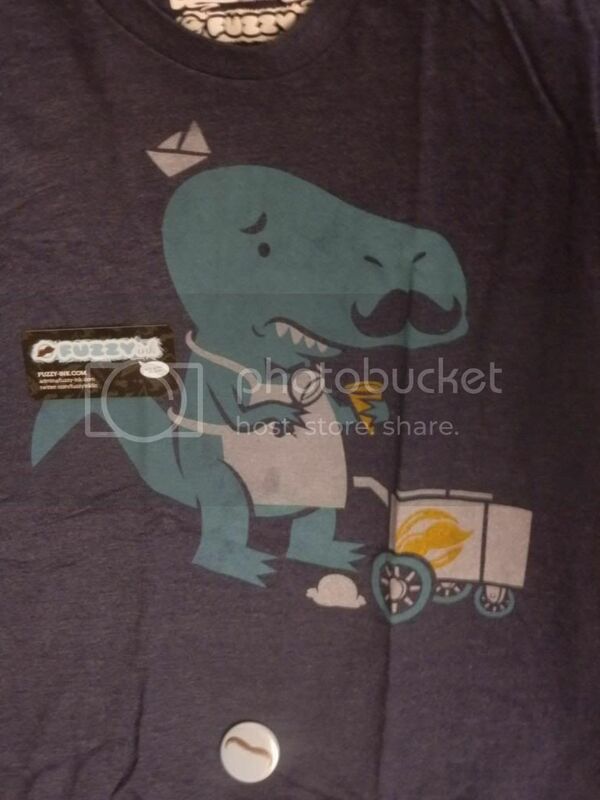 Mommy Moments with Abby's Review of Fuzzy-ink.com's Dinosaur Mustache Shirt: My kids are huge dinosaur fans and, being summer, huge ice cream fans. So, a shirt on mom that has both is a big winner! My son told me that my shirt was, "cool". Then, while out at the grocery store a teenage girl asked me where I got my shirt? She apparently loved the idea of a mustache on a dinosaur. For me this translates into a shirt that is both fashionable and mom friendly. It breathed nicely so I wasn't hotter than I would have been in a tank top and was loose fitting enough to handle the mom work I do all day! 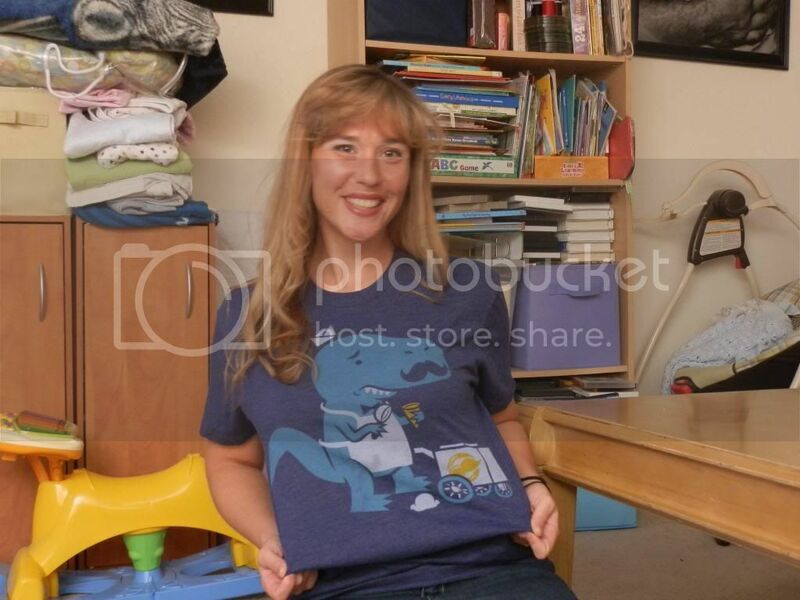 In the end this dinosaur shirt is approved by toddlers and teens for you moms and dads looking to stay fashionable and stay parental! 60% Cotton/40% Polyester 100% AWESOME! Comes in a crew neck t shirt - Color is Mint, Gold and White print on storm shirt. This shirt is very light weight and soft. It breaths very easily and the ink is screen printed, so it will not deteriorate over time. Can't get enough Mommy Moments? Need more Mommy Moments? Check out my wedding blog! That's right, Mommy Moments is getting married! Twice! I'm Abby, and I'm a stay at home mom of 4. My oldest 2 split by a year with a 4 year old and 2 year old to round things out. In addition to my human babies I also have 2 fur-babies(rescue dogs) who may as well be human to us. I have different ideas from entertaining kids to ways the world should work that may not be for everyone, but they work for me. You're visiting this blog if you're looking for ideas to entertain children or to laugh and cry with me through all my Mommy Moments whether you agree with all the decisions that brought them or not. We can't all think the same, but we can all respect each other the same way. The respect and love you give in this world will be the respect and love you get back and when life gets too serious, you may find yourself in having Mommy Moment! Like us? Review us on Alexa! 2011 Mommy Moments With Abby. Powered by Blogger.